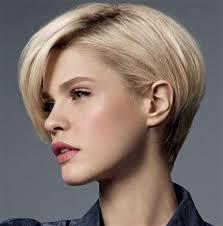 If you are looking for a change and thinking about gorgeous and exciting hairstyles, feminine and stylish short hair is the right choice for you. Short hairstyles have never been so feminine, so you shouldn’t hide behind that long hair when you can accentuate your face, neck and eyes in the most interesting way possible. If you are not convinced, take a look and enjoy! Short textured bob is an excellent option for thick #hair. When you style such a haircut, spritz some volumizing spray, blow dry your roots and then the rest of your #hair using a round brush to give your #hair some volume and finally sweep the #bangs to one side. Layered bob is appropriate for fine #hair with some texture as the multiple layers create shape and movement. When you style it, apply a setting spray at your roots and blow dry your #hair using a round brush lifting it at the roots. Tousled pixie cut is an amazing solution for slightly wavy and fine #hair and you should ask your hairstylist for layers that are longer on top. Those longer layers will enhance your curls and your #hairstyle will therefore look effortless and youthful. After you wash your #hair, apply some mousse, lift up at the roots as you blow dry your #hair and use a flat brush to style your #bangs.